As a break to allow me to gather a few more photos for another Kona update it’s time to look back at the final build week in preparation for the race. I’ll freely admit my taper probably doesn’t look much like a taper to most people, but it is genuinely cutting back. Week five was a last chance to do a bit of work before contemplating freshening up for race day. Something I’m really contemplating now! It’s actually pretty hard to really look back when your race is less than a week away, but for the sake of completeness it needs to be done. I’m going to consider just a couple of charts and keep things pretty simple. Having had what felt like a pretty easy period in week 4, never quite feeling strong it was time to put one last bit of hard work in. More of everything was the goal essentially and none of it too easy! I went some way to achieving this, but the toll of training up till then was a slight limiter. My impression of the week was that my ability to do steady work had returned and the pacing and power for this was good. I still seemed to be lacking at the really hard efforts though. Despite seriously questioning the value of this, at least with general training data as opposed to key session or race data, here’s one last visit before the race. Well it does confirm I was not doing much in terms of harder efforts with power tailing off somewhat once above my race heart rate zone. What is a positive sign is how high the average powers are for the region at or below the zone. If I want to be optimistic and draw something from this I seem to have increased my ability to generate power at lower heart rates over the past month. Certainly that’s the aim of training so I have to be pleased with that to the greater extent I think. I do have caveats about how much I trust the data for any given week, but this isn’t the time to show doubts. I’m riding better for my month of training and that’s the main thing. I now need to see this translate into a more solid race. 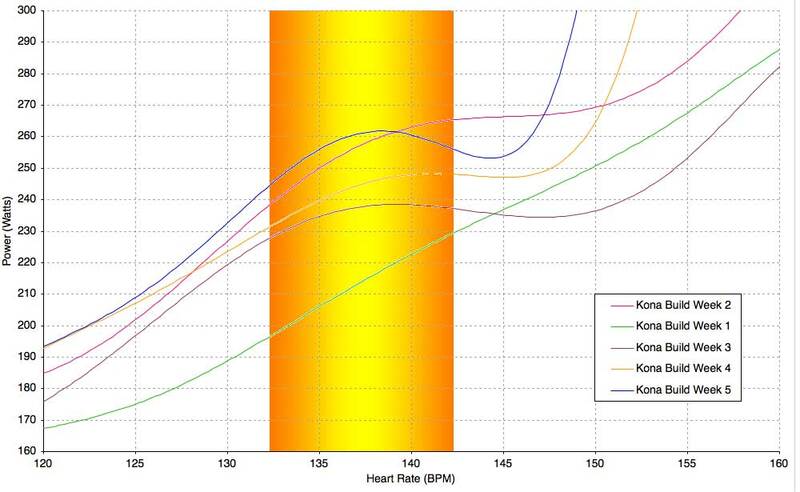 I’ll be interested to add in data from my taper in the coming weeks as my perception out here in Kona is that my heart rate has been much higher. An unsurprising result of the heat, humidity and acclimatisation process for sure. How this will translate to race performance is an interesting question. I’ll come back to this when I post up the race plan. Yes, there will be a race plan. A new candy coloured chart for your consideration! This time looking at the percentage of time spent at different powers. Don’t focus on the (low!) 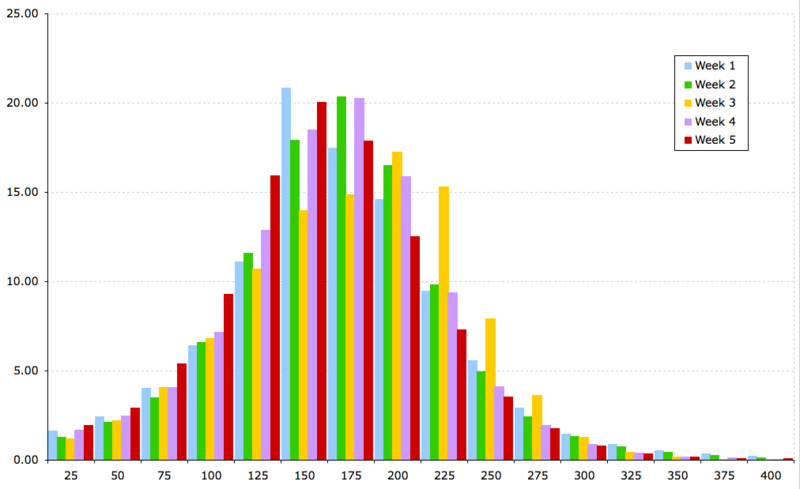 numbers too much, but more the shape of the bell curves represented by each week. What really stands out is the yellow week three. My time in the Pyrenees unsurprisingly skewing things to higher powers. You don’t have much choice, but to work harder in that sort of environment. There’s a lesson in there about the benefits of the right training environment or partners. However this is a quick analysis today so we’ll come back to this in the future. I was a little surprised to see that week five is not as skewed right as I imagined. It looks like whilst I’m certainly spending a lot less time in the lowest power regions I was falling into some middle ground quite a lot. I guess this really does represent the steady work I was doing as opposed to the hard work I was hoping for. If anything I’m more surprised to see the bars for week four and how much better that was than I recall. I have to be fair and say I can remember some quite unmotivated rides in the fifth week where I mentally struggled to keep things going along. This bar chart doesn’t hide that fact from me. My rides were at best average with enough bursts of higher powers usually when I dragged myself up a hill! I think I was less disappointed and more relieved to get the week done and it did end with a fizzle. I skipped a swim and broke my perfect run of daily runs at 32! Yes I did manage the thirty runs of at least thirty minutes in thirty days. I just couldn’t face running very early Sunday morning before my flight. The cold air versus the hot Hawaiian conditions held no appeal! Still my Saturday ride was pretty strong and more of a return to form. The kind of ride to give a little confidence! When I come to look at it later the data for my taper will be quite interesting to compare to this. I’ve sampled it a little right now and it certainly gives me something to think about. Add to that the conversations and ideas shared this past week and I’ve plenty of ideas for the future. However I’ll leave this for now so we can get back to enjoying sights and stories from Kona next time!